Did you know that August is National Peach Month? 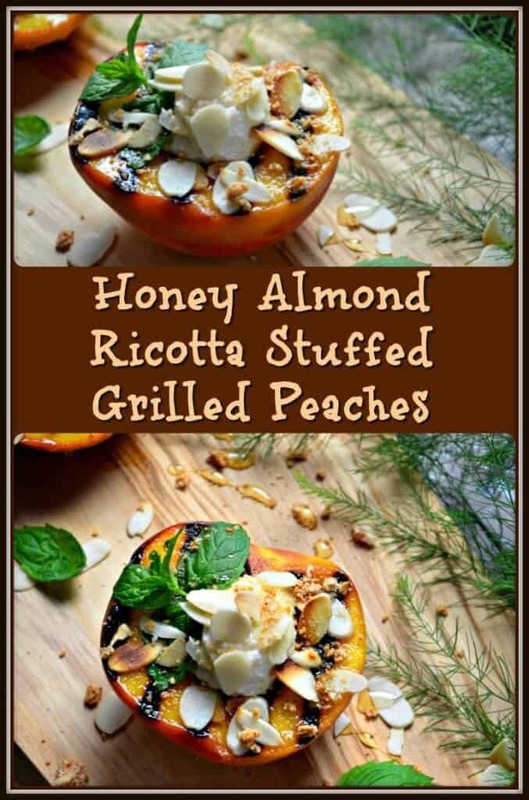 In order to help you celebrate, I would like to suggest this recipe for Honey Almond Ricotta Stuffed Grilled Peaches! A group of tastemakers from the Sunday Supper Movement will also be sharing a fantastic variety of recipes that can be made with peaches. So, settle in and be prepared to be amazed. So many mouth watering peach recipe links can be found at the bottom of this page, so be sure to check them out …would not want you to miss out! A big shout out to the event host Sue Lau of A Palatable Pastime. Thank you Sue! Whenever I think of peaches, I think of summer. Probably because the middle of summer is when this fruit is available. There will be many of you that will correctly assume that it is very hard to grow peaches in Quebec. (Most of the Canadian peaches will soon begin to arrive in the local markets (in Montreal) from the infamous Niagara region of Ontario). But despite our cold winters, my parents had a peach tree in their backyard… and not only that – those peaches were some of the best I had ever tasted! Admitted, I’ve never eaten a peach from Georgia (Since Georgia is known as the “Peach State”, I figure those peaches must really be great! ), but let me tell you, I think those backyard peaches were as close to the perfect peach that you can get. So, you might be wondering, what makes the perfect peach? Well, to start with, peaches that are picked too early do not ripen. Period. So, if the peach is too green and hard to the touch, it will never reach its optimum level of natural sweetness. So, when purchasing peaches, or picking them off a tree, look for peaches that are firm to the touch, but give in just a little bit. As the peaches ripen, they become sweeter and juicier. Another indicator of freshness is the smell. Make sure to breathe in from the stem side in order to get that “peachy” smell. Whatever you do, do not purchase peaches with wrinkly skin. This is a clear sign that the peach is drying out. I have been spending a lot of time on Pinterest lately and the pictures which always peak my curiosity are those with ricotta. I think most of you already know that I love ricotta. So much so that I make my own Creamy Homemade Fresh Ricotta Cheese. Don’t you just love ricotta? Another favorite of mine is grilled fruit. I can’t put my finger on it, but there is something about grilling fruit that just elevates the whole taste experience! And so the combination of two of my favorites things, topped with a couple more best-loved foods (i.e. almonds, honey and Soft Amaretti), resulted in this healthy, easy and tasty recipe- Honey Almond Ricotta Stuffed Grilled Peaches. What about you? Do you have a favorite recipe with peaches? I’d love to hear about it! Honey Almond Ricotta Stuffed Grilled Peaches topped with crushed amaretti cookies. This simple, healthy & tasty recipe can be made in less than 15 minutes. Brush cut side of peaches with olive oil. Set aside. In a bowl, combine the ingredients for the filling. Set aside. Place peaches cut side down on greased grill. Place peach halves on serving plate. Spoon about 1 tablespoon of ricotta mixture in the cavity (can also use small scooper). Sprinkle with slivered almonds, crushed amaretti cookies and honey. Amaretti cookies can be home made or storebought. Slivered almonds can be lightly toasted in a frying pan for a few minutes. Every Sunday, there is a wonderful group of bloggers called the #SundaySupper tastemakers that collaborate together on a theme. As was mentioned, today’s theme was Peaches and I think you’ll agree the line-up of recipes is totally amazing! I would like to thank the event host for this event Sue Lau of A Palatable Pastime. Thank you Sue!! I love peaches in any form. This looks so good! Yum yum yum i love grilled peaches! I’ve only used ricotta in savory dishes, this is beautiful! A classic for sure! Beautiful photos! What a fabulous dessert. I would also serve these for breakfast or brunch! These look like a perfect summer treat. I love how they look and can imagine how good they’d be. This recipe makes my heart sing. Lovely photos of a tasty dessert! My sister has a peach tree in her back yard—I don’t think I’ve had a better peach than one freshly picked off her tree! Your grilled peaches look fabulous!